The college years are a crucial time period when students make the transition from late-adolescence to adulthood. Importantly, this transition takes place during an extremely sensitive part of the life cycle when emotional problems and mental disorders commonly occur. Approximately 75% of all lifetime mental disorders have their onsets prior to the age of 24, and these early-onset cases are related to poorer clinical and functional outcomes than later-onset cases. Additionally, the college years are associated with a significant increase in risky health behaviors, such as excessive alcohol and cannabis use, and suicide is the second leading cause of death among college students. Collectively, these disorders and behaviors are associated with low academic attainment. Even though effective treatments exist to address these debilitating issues, only a minority of students with mental disorders obtain treatment. The WHO World Mental Health International College Student (WMH-ICS) Initiative is designed to: generate accurate epidemiological data on unmet for treatment of mental, substance, and behavioral disorders among college students worldwide; implement and evaluate web-based interventions for both the prevention and treatment of these disorders; and disseminate the evidence-based interventions found to be effective using a continuous quality improvement approach designed to prevent degradation of these interventions in dissemination and successively to improve targeting of interventions using precision medicine procedures. Annual WMH-ICS surveys with representative samples of college students in colleges and universities throughout the world are used to estimate prevalence of mental disorders, adverse consequences (on the personal, social, and academic levels) of these disorders, patterns of help-seeking for these disorders, and barriers to treatment. Longitudinal data collection with the same students across years is used to monitor changes in incidence, prevalence and treatment of these disorders throughout the college years as well as to identify modifiable risk and protective factors. The WMH-ICS surveys use a flexible and cost-effective data collection design that makes use of web-based recruitment and administration of de-identified self-report questionnaires under the auspices of the institutions in which surveys are administered. Web and phone follow-up is used to increase survey completion. The surveys use validated screening measures to generate estimates of the presence of a wide range of mental disorders thought to be common among college students (e.g. Major Depressive Episode, Generalized Anxiety Disorder, Panic Disorder, Bipolar Disorder, adult ADHD, substance abuse and dependence, and suicidal thoughts and behaviors). Iterative experiments embedded in the surveys are used to evaluate the effects of innovative methods to increase the proportion of students with emotional problems who seek treatment. Replications across successive cohorts are being used to determine the predictive validity of new methods to predict which students will go on to engage in suicidal behaviors and other risky behaviors that might require special outreach interventions. Experimental methods are being used to evaluate the effects of a wide range of internet-based interventions both to prevent and treat the emotional problems documented in the WMH-ICS surveys. In addition to implementing these experiments among the students whose disorders were detected in their surveys, we are working with student mental health clinics in selected institutions to implement parallel clinical trials among students who seek help at those clinics. The latter trials are making use of the fact that waiting lists typically exist for obtaining treatment in these clinical, making it possible for us to implement interventions using a waiting list control design as well as active comparisons with the usual treatments provided at these clinics. Our evaluations are considering not only treatment effects among the treated but also accessibility, feasibility, and respondent-burden. We plan subsequent iterations of these trials to make use of SMART designs that evaluate the relative effects of different treatments based on the specific clinical profiles of patients. Leveraging our very large cross-national database, our ultimate goal is to optimize matching the right students with the right interventions in a stepped-care model approach. All WMH-ICS interventions are initially implemented and evaluated in a small number of institutions and are subsequently disseminated to other institutions only when they are found to be effective. We use continuous quality improvement methods with process and outcome evaluations to protect against intervention degradation in dissemination. These same data collections are used to make successive refinements to the interventions as well as to the precision treatment algorithms used to match patients to treatments. Samples: Institutions interested in joining WMH-ICS need to begin with needs assessment surveys. The latter consist of web-based self-report surveys administered to representative samples of students, typically in the fall of the academic year. Tracking surveys are then administered each subsequent year. Mode: As noted above, surveys use a web-based data collection method, which enables us to conduct surveys much more cost-effectively than would be possible otherwise. Surveys take an average of 20-30 minutes to complete. The web-based nature of the surveys also allows for the addition of online interventions once high-risk students are identified. Measures: The baseline survey focuses on baseline student characteristics, presence of disorders, stressful life experiences that might be risk factors for these disorders, history of obtaining treatment for these disorders, and barriers to treatment. The subsequent tracking surveys include update information on presence of disorders, impairments, stresses, and treatments. The use of validated screening instruments allows us to generate accurate estimates of DSM-5 disorders including Major Depressive Episode (MDE), Generalized Anxiety Disorder (GAD), Panic Disorder (PD), Social Phobia (SP), Separation Anxiety Disorder (SAD), Bipolar Disorder (BD), adult attention-deficit/hyperactivity disorder (ADHD), a range of eating disorders (anorexia nervosa, bulimia nervosa, binge-eating disorder), substance abuse and dependence, and suicidal behaviors. The instrument also generates reliable estimates of self-reported health, use of services for emotional or mental health problems, college expectations, adaptation to college life, and academic outcomes. Training and Field Procedures: The WHO translation and harmonization protocol was used to create training materials, introductions for potential participants, and instruments in a wide range of languages. Informed consent is obtained from participants prior to initiating data collection. Quality control protocols are standardized across settings to guarantee accuracy and to specify data cleaning and coding procedures. The institutional review boards of the participating institutions approve the surveys before they are implemented and monitor compliance with procedures for obtaining informed consent and protecting human subjects. All these implementation procedures have been codified in a fashion that makes them easy to export to other settings in order to expand the number of institutions in the initiative. 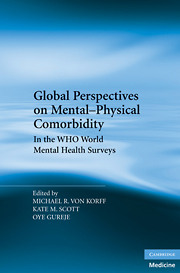 The WMH-ICS Initiative is part of the WHO World Mental Health Survey	Initiative (http://www.hcp.med.harvard.edu/wmh) The WMH-ICS Executive Committee includes Randy P. Auerbach (Columbia University, US), Corina Benjet (National Institute of Psychiatry Ramón de la Fuente Muñiz, Mexico), Ronny Bruffaerts (Katholieke Universiteit Leuven, Belgium), Pim Cuijpers (Vrije Universiteit, the Netherlands), David D. Ebert (Friedrich-Alexander University Erlangen, Germany), and Ronald C. Kessler (Harvard Medical School, US). For more information about the WMH-ICS project, please contact us here: ronkadm@hcp.med.harvard.edu. Karyotaki, E., Klein, A.M., Riper, H., de Wit, L., Krijnen, L., Bol, E., Bolinski, F., Burger, S., Ebert, D.D., Auerbach, R.P., Kessler, R.C., Bruffaerts, R., Batelaan, N., van der Heijde, C.M., Vonk, P., Kleiboer, A., Wiers, R.W., Cuijpers, P. (In press). Examining the effectiveness of a web-based intervention for symptoms of depression and anxiety: Study protocol of a randomised controlled trial. BMJ Open. Alonso, J., Mortier, P., Auerbach, R.P., Bruffaerts, R., Vilagut, G., Cuijpers, P., Demyttenaere, K., Ebert, D., Ennis, E., Gutierrez-Garcia, R.A., Green, J.G., Hasking, P., Lochner, C., Nock, M.K., Pinder-Amaker, S., Sampson, N.A., Zaslavsky, A.M., Kessler, R.C., WHO WMH-ICS Collaborators. (2018). Severe role impairment associated with mental disorders: Results of the WHO World Mental Health Surveys International College Student Project. Depression and Anxiety, 35(9):802-814. Auerbach, R. P., Mortier, P., Bruffaerts, R., Alonso, J., Benjet, C., Cuijpers, P., Demyttenaere, K., Ebert, D. D., Green, J. G., Hasking, P., Murray, E., Nock, M. K., Pinder-Amaker, S., Sampson, N. A., Stein, D. J., Vilagut, G., Zaslavsky, A. M., Kessler, R. C., & WHO WMH-ICS Collaborators. (2018). The WHO World Mental Health Surveys International College Student Project: Prevalence and Distribution of Mental Disorders. Journal of Abnormal Psychology, 127(7):623-638. McLafferty, M., Armour, C., & O’Neill, S. (2018). Adverse Childhood Experiences (ACEs) among university students and the relationship with lifetime mood and anxiety disorders. European Journal of Trauma and Dissociation, Stress Points, 32(4). Mortier, P., Demyttenaere, K., Auerbach, R.P., Green, J.G., Kessler, R.C., Kiekens, G., Nock, M.K., Bruffaerts, R. (2015). The impact of lifetime suicidality on academic performance in college freshmen. Journal of Affective Disorders, 186, 254-260.